Max/Min working radius – 30/10 m. Lifting height (from the deck) - 21.0 m. Lifting depth (lower of the deck pontoon) – 18 m. Working rate approx. 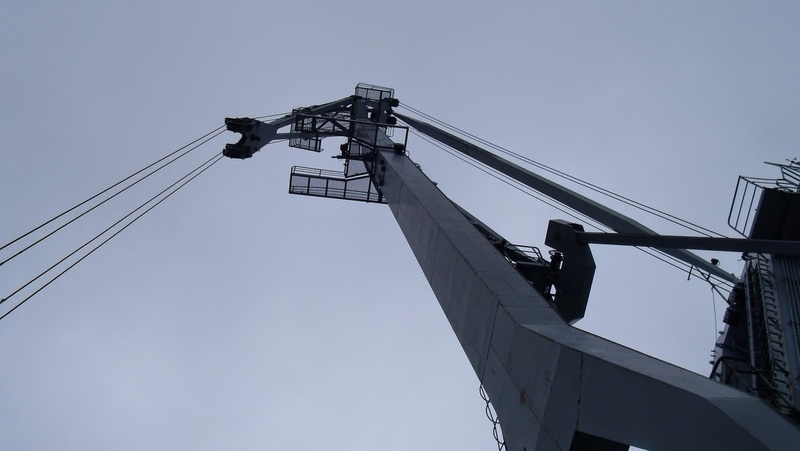 200 tons / hour (depending material with full load) Working speed hoisting – 47.5 m/min Slewing speed - 1.25 rev/min Luffing approx 45 m/min, Airdraft of the crane in stowed position – 10 m. length of the crane in stowed position with the boom laid – 51.8 m.
Crane has grab-fitted mode. In 2010 was made diving inspection: pontoon is in good condition. The whole period of exploitation the crane was in fresh water. Crane has worked mostly for dredging. Smal working hours. Ldt of the crane together with the pontoon – 432 t.